Having read both Half-truths & White Lies and I Stopped Time, two very different books, I was keen to see what delights were on offer in this book. I was not disappointed. The story is set in Streatham, London in the early 80’s. Judy Jones, pops into a telephone box to have a conversation, without her mother listening in, when a wall collapses on her. Religion, in particular Catholicism, feature strongly as themes of near-death experiences and religious fervour, not subject matter I’d normally seek out, but the strength of the writing lifts the subject matter making it immensely readable. I was instantly drawn into the book and really wanted to know how the family would cope with all the changes including Judy’s father converting to Catholicism against her mother’s wishes. 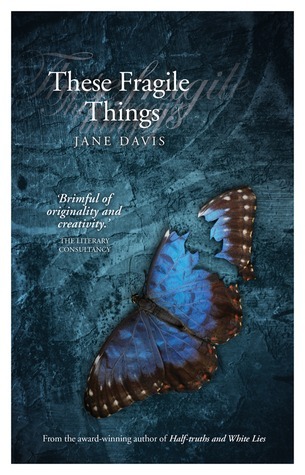 Jane Davis really does bring characters to life, mothers, fathers, friends, teachers are all perfectly described along with their actions and reactions to events. I love the occasional asides, an overheard conversation here, or a mental comparison of one home with another there, all of which helps to anchor the story. Ultimately relationships, albeit in extraordinary circumstances, are central to this book. This book tells the tale of Lottie, a woman who wasn’t around through her son’s young life. James doesn’t know, or want to know, about his absent mother until she dies and he is left a photography collection. Through these photographs he discovers more about her. I loved the way that Lottie’s life unfolded through pictures, a clever (and brave) device which worked fantastically well. It was a real change from the diary with the missing pages which is often used! The ending was perfect, not being a writer, I often think this must be the hardest part as many a promising book falls at this stage. The timing of the revelation of Lottie’s story, especially in relation to her son James was perfect. Being interested in more recent history this book was right up my street and I especially liked the fact that it examined the reality of the women left behind during the First World War. This book deserves to be read by all who enjoy a really good story, well defined characters and detailed research to back it all up! I would especially recommend it to fans of Kate Morton and Rachel Hore. I was given a pre-publication copy of this book by the author some time ago, and despite reading many books since then, this book is one I have remembered and reflected upon.